This could be your residence! Some of our readers may be in the market for a rental property. 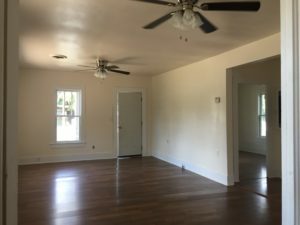 Well, our office manager, Mandi, reports that the Travis 2 house at 1604 N. Travis Avenue in Cameron is about ready for a new family! We are now accepting applications to rent this 2 bed/1 bath. Application fee is $50/ person over 18 (all persons over 18 must turn in the application), $750 deposit and $750 per month rent. Call Mandi at (254) 760-4411. If no answer, please leave a message. We’ve been finishing the updates on the house, so it will be all sparkly and ready for you! Huge back yard and screened-in porch, too.